At Chorus Connection, we love meeting choral leaders and choruses from all over the world. When we discover a chorus that is superbly unique, we feel compelled to tell their story. That's how I felt when I came across the website for Lux Choir. 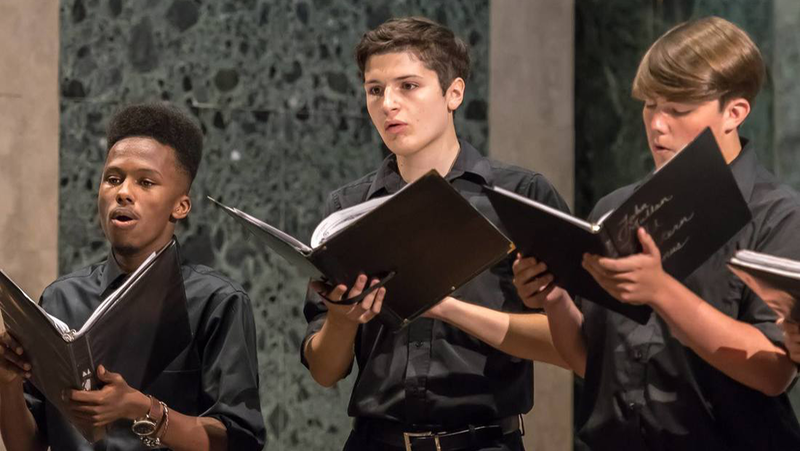 The choir was initially founded by a group of high school friends who simply wanted to get together outside of school and sing beautiful music. 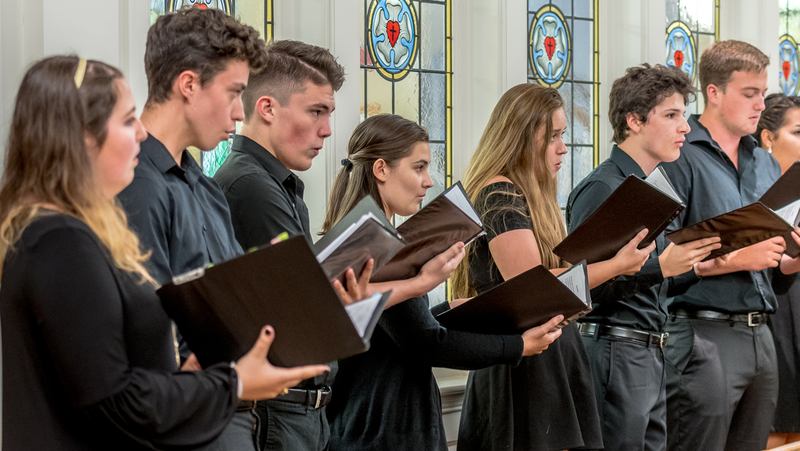 This semi-professional chamber choir is now in its fourth year and is comprised of geographically-dispersed college students who meet over school breaks to rehearse. They have recently launched their first album and continue to record and perform around Maryland, Virginia, and Pennsylvania. I spoke with Founder and Director of Lux Choir, Robby Napoli, to learn more. Robby is a senior at Gettysburg College in Gettysburg, Pennsylvania, graduating in the spring with degrees in Music Education and Composition. He founded Lux Choir in 2014 during his senior year of high school. Q: Thanks so much for meeting with me, Robby. 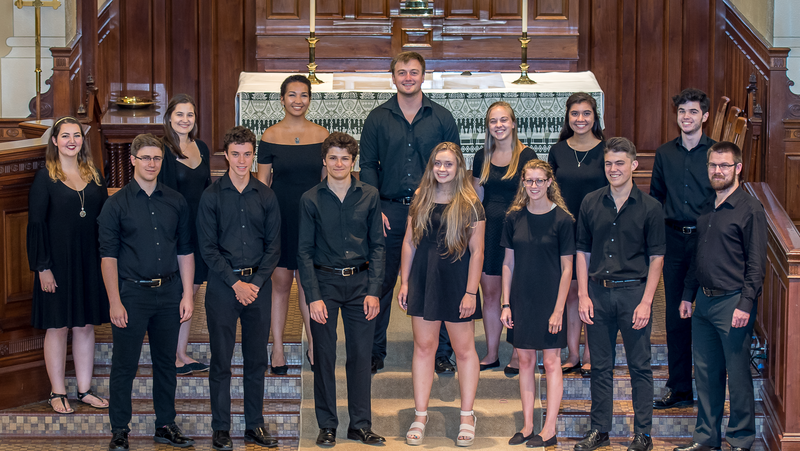 It's really quite impressive to see a group of high school students who have managed to create and sustain their own choral organization for four years! Let's start from the beginning. Why did you decide to start Lux Choir? A: It really wasn’t supposed to become what it is now! During our senior year of high school, a couple friends and I were at a choir retreat learning Morten Lauridsen's arrangement of Ave Dulcissima Maria. We fell in love with the piece but were disappointed to learn that our high school music teacher wasn't planning to program it that year. So we decided to meet together outside of school to learn the piece and, with my mom's camcorder, record it for ourselves! It was supposed to be a one-time thing. But then we found another piece for mixed choir that we wanted to do and it sort of became a recurring thing. Q: That's amazing! So, you started this choir as a senior in high school. I would imagine that it became trickier to get the group together when you went off to college. What was that transition like? A: When we went off to college, we were all over the place geographically from Harper's Ferry, West Virginia to Reston, Virginia to various parts of Maryland. It was difficult to get together during the school year so we made time over the holiday breaks to rehearse. Q: Were the singers the same or did you find new singers? A: We went to an all-male high school, so originally the group was all men. Six of the original seven are still singing with the group but now we are a mixed choir (men and women), mostly composed of old high school friends and friends from college. Q: How do you find your new singers? A: Recruitment is an interesting process - it's sort of like scouting for sports teams! We want the group to continue being a chamber group, so we don't look for someone unless we need a spot filled. When we have an open spot, a few of us will scout out some people that we know. Through personal interactions, we'll try to get a sense of how they would work personality-wise with the group and whether they can keep up musically. We don't hold auditions, but I try to find a way to hear the singer before we officially ask them to join - so that I can get a sense for what part they will sing and who they will blend well with. If we feel they will be a good fit, we will reach out directly and ask them to join. We're starting to move towards an audition-like process. We still recruit via personal relationships primarily, but those who are interested in singing with us are welcome to send in an audition and can find more info on auditions/applications on our website! Q: Your singers are really quite good! Are they all studying music at school? A: Many do study music, but actually not an overwhelming majority of them. We had about fifteen singers singing over the summer and about a third of them were non-majors. Those who are non-majors typically have a ton of choral experience, such as singing in Kodály choirs from childhood. Our lowest bass is a computer science major with a minor in music. We just work with stupidly talented people! Q: I'll say! Your recordings are absolutely mesmerizing. What's sort of your "bread and butter" when it comes to repertoire? A: We sing mostly contemporary music from composers like Ola Gjeilo, Eric Whitacre, John Tavener, and Arvo Pärt. In the past, we would just keep a list of the songs we liked and we would vote on the ones we wanted to sing. The pieces ranked highest would be the ones we recorded or performed. Now, we actually ask our members to create full sample programs and then we vote on the program we want to perform! We have a repertoire committee and usually 4-5 people will create sample programs for us. Q: That's a really great way to get singers involved in the artistic process. I absolutely love that idea! It seems like you are self-producing your concerts. Where do you typically perform? A: The group originally was focused on preparing studio recordings of the pieces we loved. Some of our singers sing with a parish church in Hyattsville, Maryland and we've been very lucky to have been given recording space at no cost. The pastor there is very supportive of our choir and they are the only reason we are able to exist, monetarily speaking. We've also recorded at Georgetown Prep, a local high school, in their gorgeous small chapel. My dad's friend is a sound engineer, so he helps us make the recordings with professional equipment. We recently launched an album with our best recordings! We actually didn't have our first performance until 2016. Now we typically do two or three summer concerts and a Christmas concert at the same venues previously mentioned. We have anywhere from 60-100 audience members at any given performance and we promote our concerts through poster design and distribution, Facebook advertising, and social media posting. And, of course, we try to use as much word of mouth as possible! Q: It's a lot of work to run a choral organization and plan performances and recording sessions. I'm curious, as a small nonprofit, what does your leadership structure look like? A: We are just now starting to organize ourselves in the way that most choirs are organized. We are planning to file as a nonprofit this fall and will create a board at that time. Right now, we function through volunteer committees such as our repertoire committee, marketing and public relations committee, executive and admin team, and concert operations committee. Everything is 100% volunteer-based. Q: Well, it sounds like it is working. As I said before, I'm so impressed with the organization. Everything from the initiative of starting the organization, the management structure, the way you market yourselves, to the quality of your recordings, all while attending school... I'm just amazed and inspired by you all. What will happen to Lux when you graduate? A: Honestly, we don’t know. Whenever someone asks me that question, I just remind myself why it started in the first place. It truly is friends getting together to make really cool music. Maybe the group falls apart, maybe it turns into an octet or a quartet, or maybe we find new people in a professional world. I can't imagine a world where I don't do this in some way! Thank you so much for chatting with me today, Robby! I'm excited to see where the future takes you. If you'd like to learn more about Lux Choir, visit their website, and follow them on Facebook, Twitter, and Instagram. Check out their YouTube videos and don't forget to purchase their new album!